The cloud is a disruptive technology that has revolutionized the way companies do business. However, a common misperception is that public cloud services are less expensive than building on-premises cloud environments, which is often not the case. Organizations must assess their needs and determine how to create a cloud environment that aligns with the business requirements. No matter what that ideal cloud ecosystem looks like, Dell can help make it a reality and provide the tools to manage all the aspects as one unified system. -Cloud technology bridges the gap between IT and the business, but on-premises cloud deployments often offer a lower TCO than the public cloud. -Dell enables organizations to create and manage cloud solutions customized to unique needs. -Organizations have several options for building a cloud infrastructure based on Dell solutions. 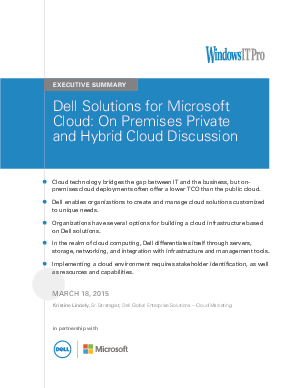 -In the realm of cloud computing, Dell differentiates itself through servers, storage, networking, and integration with infrastructure and management tools. -Implementing a cloud environment requires stakeholder identification, as well as resources and capabilities.